ATLANTA — With two outs in the top of the sixth inning on Opening Day, things were going as predicted for the 2018 Atlanta Braves. That’s the easy way to say it. But it’s how they were losing that seemed to fulfill all the preseason prophecies. The Braves’ offense, predicted to be spotty, small-ball-oriented and with almost no power, had been held to two hits by Phillies ace Aaron Nola. One of the hits — their first of the season, in fact — was a bunt single down the third-base line by Ryan Flaherty. Starting pitcher Julio Teheran, the team’s de facto ace, known to be excellent at times and maddeningly inconsistent at others, lived up to that billing. He made it to 90 pitches — but just 5 2/3 innings — before it became clear he was gassed. It was only 2-0 Phillies, but there was an encroaching sense of negative inevitability. See, the 2018 Braves were supposed to be a bad team. All the preseason projections pointed clearly in that direction. Their rebuild was almost done, but not almost done enough for a winning season. Though there were clear bright spots — the steady Freddie Freeman, the exciting Ozzie Albies, emerging young pitchers such as Mike Foltynewicz and Sean Newcomb, plus the eventual promise of superstar-in-wating Ronald Acuna — there were still too many weak spots, still too many questions. Projections varied but the Braves were supposed to lose more than they won. And on March 29, as the top of the sixth unfolded, they were doing little to change minds. Within a few minutes of Teheran’s departure, a bullpen meltdown grew the deficit to 5-0. It wasn’t all that surprising, given the inexperience in that ‘pen. Still, the disgruntled murmur had that had been building around SunTrust Park had evolved into full-throated negativity. The Braves, in the eyes and minds of many of the 40,208 in attendance, seemed disappointingly, unfortunately, exactly as advertised. But — because baseball is weird and exciting and doesn’t care what anyone thinks — that top of the sixth inning was the last time the 2018 season went as expected for the Braves, or at least it was the last time expectations were described in negative tones. What followed — and the way in which it unfurled — would go on to symbolize Atlanta’s season as a whole, those themes still defining the team as it approaches October with a division title that any reasonable baseball observer could not have predicted. Yet, the Braves told us exactly who they were in the season’s first game. Out of nowhere, the supposedly weak offense woke up — with an assist from Phillies manager Gabe Kapler, who removed Nola after just 68 pitches. Even more dramatic and unexpected was Nick Markakis’ walkoff homer an inning later that gave the Braves an 8-5 win. Since then, that has pretty much been the story of the 2018 Braves: surprise comebacks, timely contributions and bucking expectations. Snitker also takes no credit for that resilience. Besides, there’s not much he can do or say to motivate a self-motivating group, even when things go sideways. There have been very few times this season when he has had to speak up in the clubhouse. While there were big contributions from those who you’d expect to offer big contributions in that tone-setting Opening Day win, there were also some pleasant surprises. One of the biggest was Preston Tucker’s game-tying single in the eighth inning, which started a trend of role players coming up big when called upon to produce. Tucker, who occupied left field for much of the first month as the team awaited the arrival of Acuna, credits the Braves’ front office for assembling a team with such depth. “We had a bunch of guys who, if we needed to replace somebody or we needed somebody to pinch hit or step in, I feel like they felt like they were going to contribute to the same level as some of the everyday guys,” said Tucker, who continued the trend in the early weeks with a number of big hits, including three-run homers off the Nationals’ Max Scherzer and the Cubs’ Yu Darvish. “It’s really been a unique year in the sense of where we’ve gotten the production from . . . when other guys weren’t going (well) and other guys were, which is the sign of a good team,” Flaherty said. And how about Charlie Culberson, who made the most of his playing time as a fill-in and provided two walkoff homers and a slew of other big hits? There’s that theme again. It’s one thing for someone to come up big in a fill-in role a couple of times a season, but for seemingly everyone to shine when given the opportunity? That doesn’t happen often. So what has been the Braves’ secret? While the question generates the usual cliches around the clubhouse, players also cite an X-factor: the confidence of their manager. Stepping up isn’t just limited to youngsters and role players, though. It can come from a bullpen guy getting a big out or earning a spot save. It can also come in the form of non-surprise surprises. Markakis fits that latter category. Just as his Opening Day homer wasn’t exactly expected, his resurgent 2018 season has been much the same; the 13-year veteran earned his first All-Star selection after a first half that saw him produce big hits seemingly every night. Another non-surprise surprise has been Acuna. Nobody doubted his ability to contribute quickly, but he turned into a superstar — and arguably the second-half team MVP — before he reached 100 games. Five-run leads aren’t insurmountable, but nobody watching on Opening Day expected the Braves to overcome one. Likewise, nobody expected the Braves to win the division, yet here we are. Ingredients don’t always translate to success, however, and even Snitker admits to not knowing exactly what to expect when the Braves broke camp in March. He had small inklings of how some things might go, but, again, his team left certain expectations unmet. Not that there weren’t stumbles along the way. A big one came April 14 when the Braves blew a 10-2 lead against the Cubs in frigid conditions at Wrigley Field. Such setbacks can be devastating for young teams, but, again, the 2018 Braves have shown they’re not the typical young team. “Those are the points where you can go downhill, and we didn’t go downhill. We came back and started winning some more,” Freeman said. “Those are the little games where you sit back and (think), “Whoa, I think we’re gonna be good this year,'” Freeman said. With the postseason now calling, the Braves are sure to again face low expectations. The franchise hasn’t won a postseason series since 2001, a string of first-round or wild-card-game exits having long replaced Atlanta’s reputation as a World Series contender in the ‘90s. 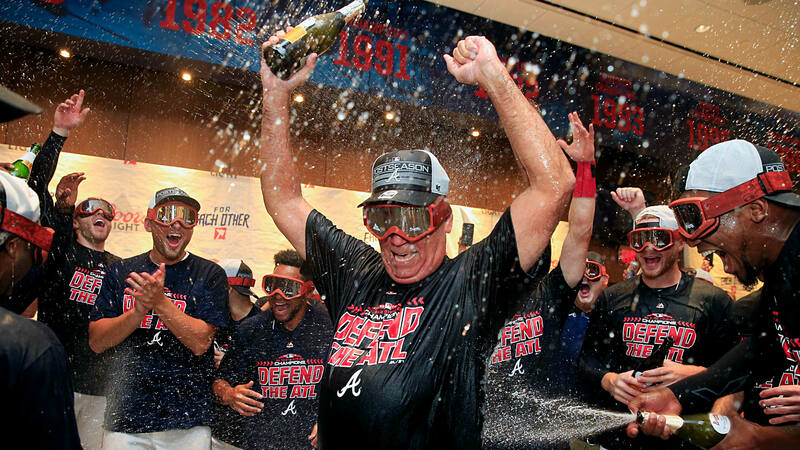 As one might imagine, however, these Braves are only concerned with the present — and winning.